Thanks to my good friend Gibson for the pic. Upon first glance at the beer lineup for this weekend’s Belgianfest, the first thought that ran through my head was, “Uh, oh.” There are quite a few beers that I’d love to try, and tough choices will have to be made if I intend to maintain at least some sense of sobriety. More information for the festival can be found here, and a full list of beers can be seen here. Following are my picks for some of the beers that I’ll be targeting. Tickets for the festival are currently still available online, and I’m assuming there will be some available at the door as well. Tickets are now sold out! American Brewing Pig Pucker – This wood-aged sour beer sounds right up my alley. They also served this at the Washington Winter Beer Festival to rave reviews. Black Raven Bourbon Barrel-Aged La Petite Mort – This award-winning strong abbey brown ale aged in bourbon barrels might have been the first beer from the Redmond brewery that completely blew my socks off (at Winter Beer Fest a few years ago). I’ll always seek this out when I see it on a list. Big Time Jack Candy Grand Cru – At 9.3% ABV, this strong ale is incredibly drinkable. Finishes with a solid bitterness from the use of Saaz hops. Anacortes Sour Red – Anacortes brought a sour beer to the first Belgianfest two years ago that was great. I’m hoping this one follows suit. Engine House #9 Love Child Kriek – My last trip to Engine House #9 in Tacoma back several months ago featured two really impressive beers: a fresh hop harvest ale, and a bourbon barrel-aged stout. Shane Johns is the new Head Brewer at #9, and over the last few months they’ve really started having fun. In addition to this Kriek, they’ll also have a Bourbon Saison that sounds intriguing. Fremont Brewing The Lamb – If you can’t tell, I’m a fan of sour/wild ales. Fremont is bringing a saison they’ve aged in French Oak wine barrels with the addition of our friend Brett (brettanomyces lambicus). Hale’s Bourbon Barrel Aged Belgian Gold – I enjoyed their recent Bourbon Wee Heavy so much that I can’t pass this up. Silver City La Fat 2007 – This vintage version of their Fat Scotch Ale is brewed with a Belgian yeast strain, and then the beer was aged in French oak. This is just the tip of the iceberg of what I’d like to try. One notable omission on the festival list though is Big Al Brewing. Where are you Big Al? 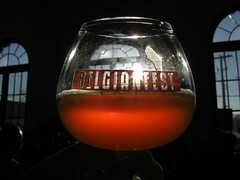 I love your Sourlicious, Kriek and the other sour brews you’ve poured over the years.